Just as we were all getting used to watching movies on Blu-Ray, Swinburne University of Technology in Melbourne, Australia has developed a DVD that holds 1.6 terabytes of data - or about 2,000 movies. There is nothing like having your entire movie collection on one disc. James Chon of the Swinburne University of Technology holds up the revolutionary new DVD. All this is made possible by adding a fourth and fifth dimension to an optical disc. By doing this, a range of different colored wavelengths can read the same physical location. Current DVDs use a red laser, while Blu-Ray DVDs naturally use a blue laser. Researchers at Swinburne University say that a commercial release is still five years away, even though an exclusive agreement has already been signed with Samsung. But will the everyday consumer need such a huge optical storage medium? 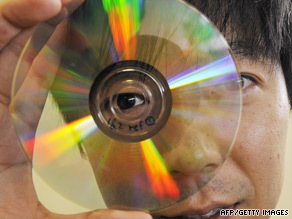 Just think about the potential price of just one disc, let alone the player. The steeper price of Blu-Ray discs and players have hindered that technology from gaining a large share of the DVD market. With hard drives exceeding 2TB and the future of movies heading towards digital downloads through services such as Netflix, the future of DVDs, especially Blu-Ray, may be in peril. On the other hand, you always will have the people who want a physical disc with a case and artwork so they can proudly display them. Does the thought of having a 1.6TB disc excite you with its possibilities? Or do you cringe when you think about yet another new format that might force you to go out and buy "The Terminator" again for the fourth time?